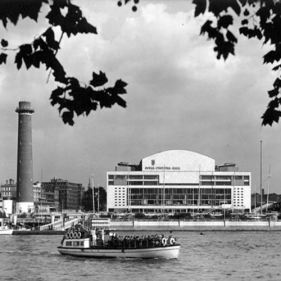 As part of the Southbank’s long-term programme of restoration and improvement, and alongside the renovation of the Hayward Gallery and the Queen Elizabeth Hall, the Southbank has opened up their extensive archive to the public. The Archive Studio is home to this innovative programme and will host an evolving series of events and exhibitions over the next two years. The Archive Studio is a free-standing, self-supporting structure; an open framework that makes the scale of archival process apparent to visitors, allowing them to meet the archive team and actively engage with the collection. Held together with polished brass nuts and bolts and clad in perforated hardboard the Archive Studio complements the iconic, Grade I listed, modernist interior of the Royal Festival Hall. The Studio Archive is now completed and open to the public.